When I was a seminarian, I assisted a priest who was saying Mass at a prison. Before Mass, I spoke with this young guy who was articulate, likeable, and faith-filled. In the context of the conversation, I learned that he would be in prison for twenty years. As I recall, he was there because he was found guilty in the death of another human being. I never really thought much about what I envisioned a typical inmate to be like, but this guy probably wouldn't have been what came to mind. I'm not saying he didn't belong in prison. I'm just saying that my disposition is different about inmates because I had met one. He was no longer a category, but rather a person. Similarly, I've often found that when people talk about "illegal immigrants," they think about categories. But, once you've met somebody who is here illegally from another country, working non-stop, trying to raise a family, and sending money back home to relatives, it changes your way of thinking. Again, I'm not advocating for a particular immigration policy. I'm just saying that when we think of "this immigrant" instead of "immigrants," it changes us. This immigrant has a story, a family, a name, a smile, and a history. He or she is not a statistic. I remember once speaking to somebody who was very upset about the illegal immigrants in this country. I mentioned a couple of persons that we both knew who are here illegally. The person said, "That's totally different. They are good people just trying to help their families. I'm talking about other people!" Quite often, I hear people speak about "the Church." In doing so, they are often complaining that, "the Church" hates divorced people or homosexual people. The Church has too much money. The Church doesn't do enough to help the poor. And, if I try to convince them otherwise, I'm often dismissed because they think that I get paid the big bucks to defend "the Church" no matter what. But, sometimes we think about the Church too abstractly. The Church is not an abstraction. The Church is Pope Francis and Pope Emeritus Benedict. The Church is the Blessed Virgin Mary and Padre Pio. The Church is aSister Honorius--my grammar school vice principal, my parents, my parishioners, those immigrants illegally in the United States from Ireland and Brazil, and that prisoner I met many years ago. Do they all have too much money? Do they do too little to help the poor? Do they hate homosexuals or divorced people? The Church is the Bride of Christ. He chose her. He loves her. But, it is individual Christians who disfigure the Body of Christ. It is through my fault, my fault, my most grievous fault that I do not love enough, have too much pride, too little purity, too much anger, too little kindness etc. It is not "the Church" who fails to love everyone. It's me. It's not "the Church" who isn't generous enough to the poor. It's me. One of the things I've loved about being a priest is being a very public face for "the Church". Obviously, my faults, sins, and weaknesses can obscure the true face of the Church. But, when I do it right, I find that I can help people really to love the Church. When I'm on my game, they discover through my ministry that in the pulpit, the full glory and beauty of the Gospel can be proclaimed, but that this fullness of truth doesn't crush the weak or cast anyone away. You can preach the Third Commandment in its entirety, for instance, and still have the people who aren't following the Third Commandment know that they are loved. You can preach the full truth about marriage and still have divorced and remarried people know that they are loved. An ancient term for a priest is "pontifex." It means, "one who builds bridges." The priest builds all sorts of bridges. Through his ministry, his first responsibility is building the bridge between God and man. He does this through preaching the word, offering the Mass, administering the Sacraments, prayer, and through his very being. But, the priest also builds bridges between individuals in the parish, and between the parish and the larger church. He keeps them both from making abstractions of one another. A few years ago, I recall a big political issue about the "bridge to nowhere." I think in the life of the Church, if we think only in terms of "homosexuals, immigrants, priests, parishes, archdioceses, prisoners, the sick, the poor etc," we risk weakening our communion. Tomorrow, I am travelling with a group of priests to the Holy Land. Among other places that we will visit is the Church of the Annunciation. A priest friend of mine always mentions that in that church there is a sign that reads, "Verbum Caro Hic Factum Est--The Word Became Flesh Here." In Christianity, specificity matters. The Word became flesh in a particular place at a particular time. Priests--men who build bridges--do not build bridges to nowhere. They link particular persons. They bring the Gospel to particular divorced persons, particular poor persons, particular homosexual persons, particular young people, particular unbelievers etc. They link particular persons in particular parishes with the particular bishop and the particular persons who assist him. Particularity is definitely more work. It would be easier to deal with vague abstractions. I would rather deal with my vague sense of "not being as good as I should be" rather than my specific faults. I would rather have a general sense of forgiveness than to forgive that particular enemy for that particular offense. Priests build bridges between specific points. Sometimes, it can feel like we are building the Bridge Over the River Kwai! Just as it nears completion, somebody blows it up! But, the priest is to keep building. He builds bridges between God and man, between spouses, between the parish and the diocese and the Universal Church, between enemies, and between believers and unbelievers. ﻿﻿If any one of us should fail, it is not "the Church" who has failed. It is the individual. The Gospel and the New Evangelization are all about particular persons. Priesthood is about loving and building bridges between particular persons. Although the priest shares in the office of "bridge building" in a unique way, every Christian is called to work in the building of bridges. So, let's all begin again today. Jesus is the one true priest. He builds (and is) the particular bridge from the Father to each one of us. He builds (and is) the bridge between each one of us. So today, whether it be homosexuals, the divorced, the poor, the Church, prisoners, the charismatics, the Latin Mass folks, the sick, the parish, the archdiocese, immigrants or whatever, let us not be distracted by abstraction. Abstraction is the Devil's game. Christianity is about particular persons. It's about particular persons encountering the particular person of Jesus Christ. Each particular person needs to hear the Gospel in all of its fullness. Each person needs to experience the love of Christ as particular to that person. Pope Francis--whose twitter account is "pope francis @pontifex" is the "Greatest Bridge Builder, Pontifex Maximus." He keeps driving his security details crazy because he seeks to express his pastoral love with particularity. He doesn't just want to talk about loving the poor, caring for the sick, or taking care of priests. We read stories that he heard some priests were having lunch, so he showed up and ate with them. He goes to a particular prison and washes the feet of particular inmates. He stops the "popemobile", gets out, and hugs a particular boy who has cerebral palsy. The Gospel of Truth and Love are directed to particular persons. Perhaps one reason that the Catholic Church in the United States is shrinking is because we have yielded so much to the abstraction of the Devil. We need to preach the Gospel (in all of its fullness) to individuals. We need to embrace and love individuals. We need to be a people of particularity and not a people of abstraction. If we are not dedicated to particularity, then we really are building a bridge to nowhere. Let's begin again today to love, forgive, and embrace with particularity. Let the Word become flesh, here. This past Easter Vigil I had the great privilege of baptizing three and receiving five others into the Church. Then, I confirmed all eight of them. Some of them asked for a copy of the homily I gave at the Vigil, but I had never written it out. This is what I can recall of it. Once, when speaking with an older married couple, I inquired about how they came to be married. In what appeared to be a well-rehearsed team effort, she said, "Father, he wouldn't stop bothering me once we met. I wanted nothing to do with him. But, he would show up places to see me, would send me letters, and kept asking me to go out with him. I finally realized that he was never going to leave me alone and so I said, 'yes.' And the rest is history." The husband grinned the whole time she was speaking and added at the end, "That's exactly how it happened, Father." During the Sacred Triduum, the Liturgy has been revealing something quite shocking to us. God has lowered himself to be a beggar in front of us. God has been trying to win our love. He's been showing up all over the place, doing all sorts of things to seize our attention. God is trying to prove himself to us. We know, of course, that it really should work the other way. We should be trying to impress God, win His approval, convince Him that we are worthy of His love. But God has done exactly the opposite. He has condescended to become our pursuer. God is trying to win us over, to romance us. On Holy Thursday, Jesus invites us to dine with him. He allows us to place our heads upon his heart, to listen to the sound of his heart beating. He feeds us with His very Body and Blood so that we can experience the intimacy of His love. But as if this were not enough, he lowers himself right down to the floor. He--God--washes our feet. He kneels down on the floor in front of us and washes our feet, dries our feet, and kisses our feet. God kisses our feet. This is how much He wants us to be convinced of His love. This is shocking. God is trying to win us over. On Good Friday, He lowers Himself even more. He lowers Himself and takes on the form of a slave, obediently accepting even death, death on a Cross. If lowering Himself to the floor and kissing our feet were not enough, now He lowers lowers Himself even more. He lowers Himself and takes on the depths of our human experience. There is no depth to which Jesus will not stoop for us. He enters into the depths of our sufferings, the depths of our pain, the depths of our weakness. Jesus descends even into our sins. St. Paul tells us that He who knew no sin became sin for us. On the Cross, Jesus lowered Himself to become sin for us. There is no place that He will not go for us. He lowered Himself to experience death. He lowered Himself into the grave for us. Jesus continuously lowers Himself to the very depths of our human experience to prove His love for us. Tonight, during the Easter Vigil, we see why Jesus lowers Himself to all of these places. We tend to think that these realities--suffering, sin, and death are at the very depths of our human experience. They pose a barrier to us. There is nothing beyond them. We tend to think that there is nothing beyond them. The world lives as though the final word on our existence is suffering, death, and sin. Our weaknesses define us. Our sin and faults are the final word. The grave is the last place we can go. The great fear of every human person is that they will not be loved eternally. Tonight, we know that Jesus has entered into these very depths and where there once was a great stone preventing us from going any further, He has shattered that stone. Jesus--through the power of the Resurrection--has broken through the wall of our limitation. Death and Sin no longer have power. He has entered the tunnel of our existence and has broken through the other end. And where does this other end lead to? It opens up to the eternal love of the Blessed Trinity. Tonight, three among us will enter into the waters of the Baptismal Font. 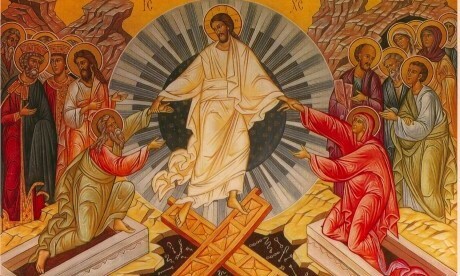 You will enter with Christ into His Death and Resurrection. You enter the tomb of the Baptismal Font confident that you will emerge from the other side. And what is that other side? It is the pathway of the Resurrection. The tomb is not the end. You will enter into the Eternal Love of the Blessed Trinity. Similarly, all of you who will be received into the Church tonight and receive the Sacrament of Confirmation, you will be strengthened in your union with Christ. You will be strengthened by the Holy Spirit to live more courageously in this eternal love. There is no depth to which Christ will not descend to prove His love for us. In fact, tonight in that baptismal font, you will be taken all the way back to the depths of our humanity. You will be taken all the way back to the sin of Adam. Christ will go so low that He will get underneath that original sin. He will shatter the power of that sin and restore you to the One who created you in love. He will return you to what were the first words of our scriptures tonight: "In the Beginning." What was in the beginning? In the Beginning was God. In the Beginning was the Blessed Trinity. In the Beginning was the Communion of Love. And, in Jesus, we are returned to this beginning. In the Exultet tonight, we heard that on this truly blessed night, things of heaven are wedded to things of earth. This is what tonight is about. Tonight we experience anew the depths to which God will stoop in order to win us over. God is wooing us, pursuing us, romancing us, trying to make Himself look good to us. God has kissed our feet, suffered everything, lowered Himself to death, become sin, and entered the depths of our humanity so that we might might accept His proposal of marriage. Tonight, thanks be to God, things of heaven are wedded to those of earth. We have a spouse who loves us eternally. God has become our spouse.